If you have been thinking of how to be a proud owner of the latest Tecno Camon CX or the Camon CX Air variant, we have an exciting news for everyone! 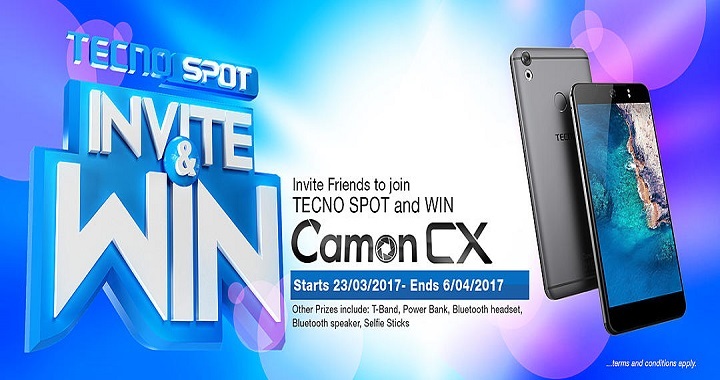 Tecno mobile is giving out a brand new Camon CX to their fans. We at RUBIZTECH are here to ensure that you don’t miss out on this deal so, this article will guide you on how to be the lucky winner. As you all know that keeping everyone encouraged and motivated to stay with us is what we know how to do best, hence If you miss out of this activity, it is as good as missing out on a 100 million US Dollars!!! Tecno Mobile announced the Latest Tecno Camon CX devices yesterday. Both are the successors to last year’s Camon C9 and arguably their best “Camon” device till date. Like its predecessors, the latest Camon CX (or Tecno Camon C10) phones are camera-focused device with photo enhancing features to deliver good pictures. What are the Amazing Prizes? It’s better to share this thread to your social media networks, ask your family, friends, colleagues, roommate, school mates etc to Join TECNO SPOT to support your entry. d. Either will be ok. So what are you waiting for? Start commenting below now and good luck! Winners of the latest Tecno Camon Cx phones will be announced on this same post. Good Luck! the design beats that of the camon c9 hands down. from start to finish.